Philomine Lakota, center, laughs as she helps her senior students learn the Lakota language last week at Red Cloud Indian School. She has been honored for her linguistics teaching. Philomine Lakota, center, teaches her senior students how to transfer from speaking about a single object to multiple objects in Lakota during class last week at Red Cloud Indian School. Philomine said if you put your mind to learning the Lakota language, you can do it. All the words are phonetic; you don’t have to worry about words like "no" and "know." Philomine Lakota has her senior high school students make sentences based upon the day's lesson of talking about multiple items, not just singular items, during class last week at Red Cloud Indian School. If there was ever any question about Philomine Lakota’s rapport with students, one word should erase all doubt. “Uŋčí” (pronounced oon-chee) is Lakota for grandmother. 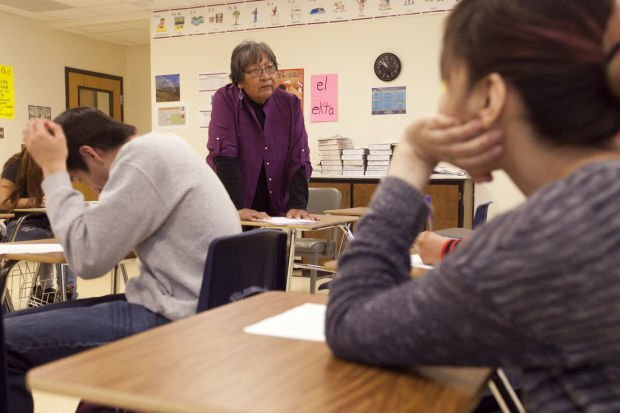 Affection for the 68-year-old educator runs deep at Red Cloud Indian School, where Philomine teaches nearly half a dozen Lakota language classes daily. The private Catholic school serves elementary, middle and high school children on the Pine Ridge Indian Reservation. Philomine has been helping Red Cloud students learn their native tongue for a decade. But her lessons impart so much more than Lakota words, spellings and expressions. She’s given her young charges a sense of identity and belonging. “She’s taught us not only the language, but the stories and the culture,” Richards said. In keeping with that humility, Philomine always turns such positive attention back to the school, its students and staff. “Such great things have been happening here,” she said. The unassuming teacher won’t admit it, but she’s a driving force behind some of those great things. As head of Red Cloud’s Lakota Language Department, Philomine has been instrumental in helping to craft standardized classroom materials for students in kindergarten through 12th grade. That means Red Cloud teachers no longer have to piece together lesson plans from various sources and come up with their own material. They teach a unified curriculum that builds upon lessons learned the previous year. Philomine is uniquely qualified to lead such efforts, said the school’s executive vice president, Robert Brave Heart Sr.
“She has a command of the Lakota language,” Brave Heart said. People who can use and understand the language like her are a “dying breed,” he added. In short, Lakota is no longer learned at a rate that keeps pace with the passing of fluent elders. “The really fluent speakers from (her) generation are leaving us,” Brave Heart said. Those left behind are more apt to think, speak and interact in English. Philomine aims to change that. She’s equipping students to keep Lakota alive in their school hallways and homes, and, after they graduate, on their college campuses and in their future workplaces and social circles. In the late 19th century, the federal government established boarding schools to educate Native American youth. Native languages and customs were discouraged in favor of adopting American speech and culture. Philomine grew up under those assimilation policies. She was punished in her youth for speaking Lakota. The boarding school she attended on Pine Ridge Indian Reservation insisted English be spoken. Philomine and her peers were forced to abandon their native tongue. But they left so much more than their language behind in those boarding school classrooms. They let go of their identity. Such moments in her past can be painful to recall, but the present gives Philomine equally great joy. But some teaching methods are unique to Philomine and her understanding of the language. Philomine said she was surprised many students had difficulty saying guttural 'h' sounds required to speak Lakota effectively. So she started having students chew gum to build saliva in their throats to make the sound. She was raised speaking Lakota and believed everyone could make the sound before she starting teaching the Lakota language. She spends her school days encouraging students to speak the language she was discouraged from speaking so many years ago. But she wasn't always a teacher. Philomine dabbled in a number of professions before settling on teaching. She has worked as a secretary, bookkeeper, payroll clerk, family advocate and even a police dispatcher. “I’ve done a lot of things in my lifetime,” she said. Philomine never fancied herself an educator. She even at one time swore she would never teach. She taught Lakota to college students before she accepted a position at Red Cloud Indian School in 2005. Red Cloud Indian School is unique in that Lakota isn’t merely an elective. High school students must earn enough credits in Lakota in order to graduate. Philomine takes her course matter seriously and expects her pupils to do the same. There’s no conversing in English; she leads her high school junior and senior classes entirely in Lakota. Philomine tells her students she doesn’t expect them to be fluent by the time they leave. They should, however, have a good linguistic foundation on which to build. “I tell them, 'I’m giving you tools to use in the future,'” she said. Many Red Cloud graduates know enough to test out of beginning collegiate Lakota language courses, according to Christopher Ives, Red Cloud’s associate director of communications. When Philomine arrived at Red Cloud, she aspired to see Lakota language classes regarded as highly as math or science. That happened last May when valedictorian Savannah Jensen delivered her address entirely in Lakota. Hearing her native tongue spoken by one of her students is a moment Philomine will never forget. Philomine credits Red Cloud administrators and teachers with backing and aiding her efforts to promote and revitalize the language. 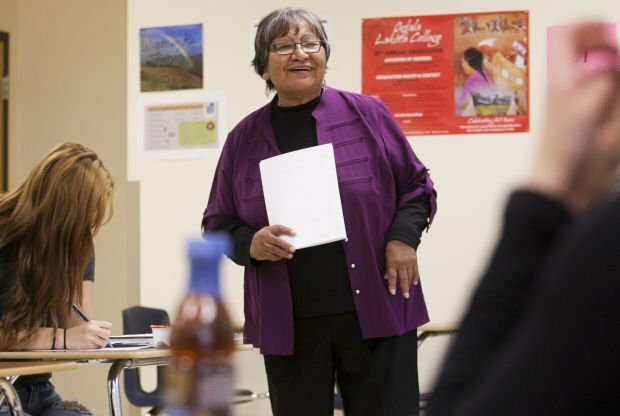 The school’s new systematic approach to teaching Lakota has given her the necessary linguistic tools and support to nurture a new generation of Lakota speakers. But her work is not finished. With textbooks and other classroom material now complete, she and the staff have set their sights on taking Lakota outside the classroom and into the community. Red Cloud’s plan has always been an ambitious one, he said, but people like Philomine have made it possible. “She’s been the most influential person in our Lakota Language Program,” he said. Her ability to equip younger generations to understand and communicate what’s been described as an endangered language puts her in rare company. “Others are coming after her, but they don’t have the same level and command of the language,” Brave Heart said. But it’s never been just about the language, he added. For more information on Red Cloud Indian School’s Lakota Language Program, visit www.redcloudschool.org.